Choosing the right light is easy when you follow these tips. 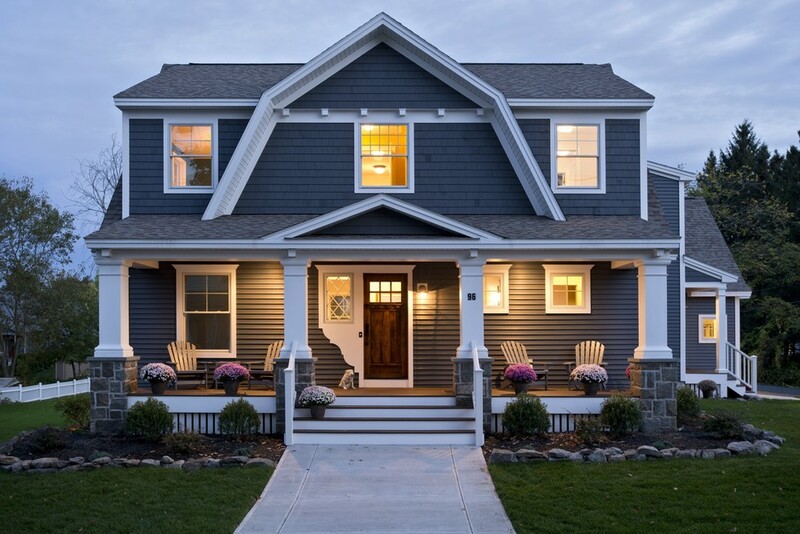 Exterior and front door lighting are an important design element to the home. Not only does proper lighting help create valuable curb appeal, having the right amount of lighting can help create a sense of safety and security. Having a beautiful and welcoming front door entry includes lighting it up with a design that aims to reinforce the style of your home. Updating your lighting can be DIY project, but even if you have to hire a pro, it’s generally considered to be a low-cost home improvement upgrade that returns a high value. If you already have lighting by your front door and want to replace the lamps, you’ll need to decide the appropriate style, color and size. There are numerous choices for exterior lighting and when planning a trip to the lighting supply store, it’s a good idea to bring with you a few photos of your home’s exterior. Get a shot looking straight at your front door, and get a shot of the whole facade as well. You may need to purchase several exterior lights and will want them to match so have a good count of all exterior lights needed. If any of your lights need to be motion sensitive, have a count of how many so you can include that in your purchase. If you’ve saved any great front door lighting project in your Porch Scrapbook, you can simply pull that up on your mobile device at the store. Given the fact that your front door lights are located outdoors, you’ll want to make sure you are buying a light that is rated for outdoor use. Even if your front door is in a protected area, there is still a possibility of dampness from wind, fog or mist (like ocean spray). There are two basic types of outdoor rating, a UL damp rating and a UL wet rating. A damp rated light is appropriate for front door lights situated under the eaves or under a covered porch that has a low chance of getting wet from wind, rain, snow or mist. A wet rated light is a fully exposed light that will be subjected to regular bouts of wind, rain, snow or mist. If you aren’t sure, purchase UL wet rated lights. With so many colors and styles to choose from, many homeowners like to take the lead from the overall architectural style of their home. You might find yourself gravitating towards a particular style of lighting that coordinates with your door style, window style or any other architectural elements. 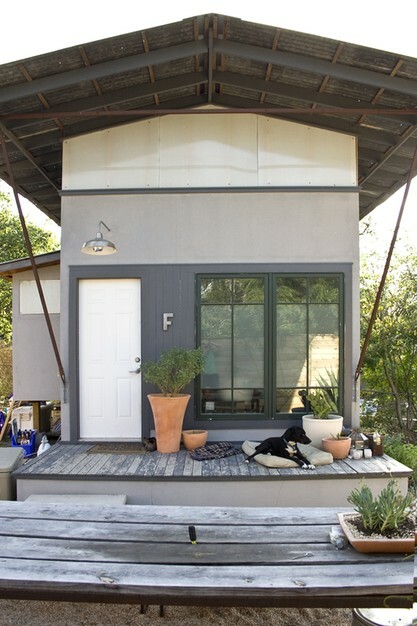 Once you’ve narrowed down your shapes, you’ll want to select a metal color that coordinates with your windows, front door hardware or any other metal pieces on your home. If you can’t decide between several styles, it might be worth it to purchase them, hold them up next to your front door, and then return the lamps you don’t want to use. Check with your lighting store about their return policy. There aren’t stead-fast rules for the size of light you choose however there are some general guidelines to make the process of buying the right light for your front door easier. Below we’ve highlighted the three main placements of front door lighting as well as some basic rules of thumb for light sizing. 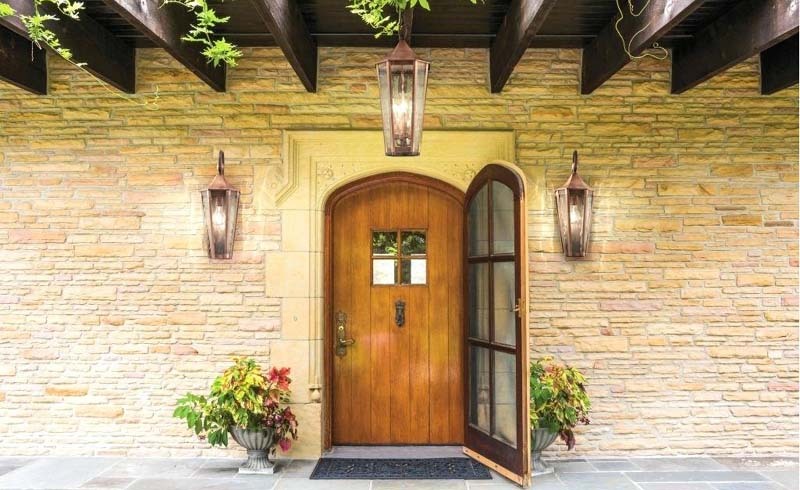 Follow these tips for a great front door lighting design. 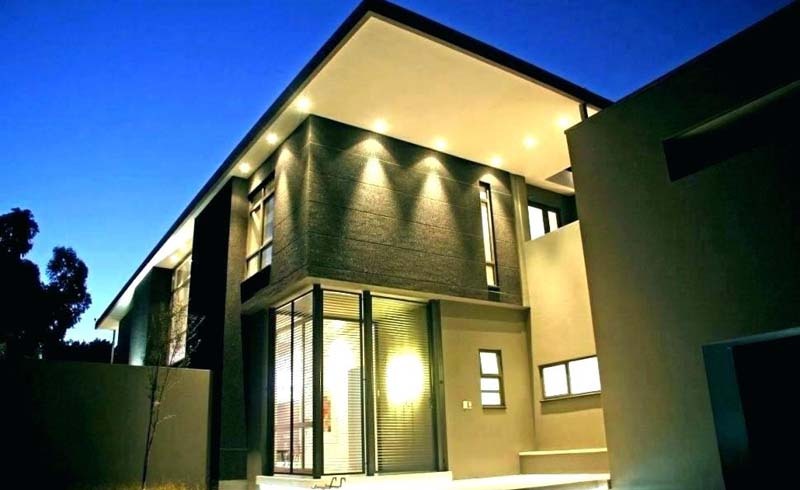 This home by Gelotte Hommas has strong, symmetrical lines that called out for equally symmetrical lighting. Not sure what size sconces to buy? A good rule of thumb for lighting placed on either side of the front door is to purchase lamps that are about 1/4 of the height of the overall door size. For this home, the sconces chosen are a bit larger than this however their larger size is balanced by the heavy, massive columns. 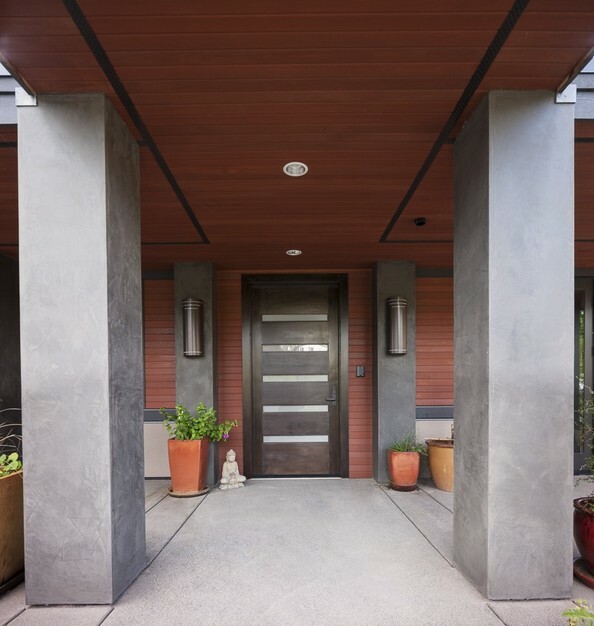 This home by Witt Construction shows that a single sconce on one side of the front door can work well. This home has a large front porch so it made sense to include additional overhead lighting to illuminate the lower facade of the home. With one light next to the door, you can generally use a lamp that is about 1/3 the size of the door, slightly larger than if you were using two lamps. Some homeowners tend to place the lamp on the same side as the doorknob, to make inserting the key in the dark easier. For this home by Moontower Design Build, a singular overhead light is large enough to light the small front porch. This schoolhouse style lamp is sheltered by an overhang, which will keep rain from falling on the homeowner while entering the home. Make sure you have enough head room – the bottom of the pendant shouldn’t be lower than 7 feet (84″) from the floor. Don’t worry if you feel overwhelmed at the thought of changing your front door lighting on your own, that’s what the pros are for. Licensed electricians are experienced in electrical wiring, current building codes and outdoor lighting safety. They are also experienced in safely climbing ladders. So if you feel that changing out or installing a new front door light is beyond your capabilities, don’t hesitate to consult a pro. Professional electricians are easy to hire and can either charge you by the hour or by the project. When interviewing professional electricians, discuss how many outdoor lights you need them to install, review any height or access restrictions, and if you have your lights already purchased, have the electrician take a look and see if the lights will require any special parts or tools. The more you can communicate the details and scope of the project ahead of time, the better.